The newest perfume from the independent natural line Providence Perfume Co is Love-In-A-Mist, a feminine floral fragrance named after a wildflower of the same name. Its composition includes notes of love-in-a-mist, mimosa, pink peppercorn, sandalwood and sweet clover. The flower Love-In-A-Mist (Nigella damascena) is an annual plant with pale blue blossoms surrounded by delicate, ferny leaves. I've never seen it in "real life," but it sounds like something that would have been mentioned in Elizabethan and Victorian verse, doesn't it? And apparently it has inspired artists and artisans to create textiles and jewelry as well as some beautiful illustrations. The dry down of Love-In-A-Mist is a subtle jasmine with hints of sandalwood; it's sophisticated without calling attention to itself. This fragrance wears close to the skin, but the nice surprise is that it has exceptionally good longevity for an all-natural, botanical fragrance. I'm normally sad (yet resigned) when a natural perfume vanishes from my skin in an hour or two, but Love-In-A-Mist clung to my wrists for nearly eight hours. My favorite Providence Perfume Co fragrances so far have been Rose 802 and Mousseline Pêche, but Love-In-A-Mist might be giving those two some gentle competition. I'm enjoying it for the current (and changeable) seasonal transition in my corner of the world, and when winter finally keeps me inside, I'll be able to dab on some Love-In-A-Mist as a promise of the spring to come. It's well worth a try, if wistful-feeling natural florals are your thing too! 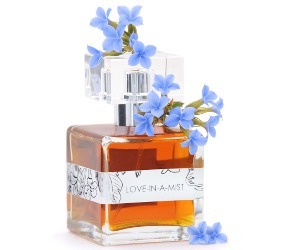 Providence Perfume Co Love-In-A-Mist is available in 5 (roller, $45) or 50 (spray, $175) ml Eau de Parfum. For purchasing information, see the listing for Providence Perfume Co under Perfume Houses. Note: top image is de dessus by OliBac at flickr; some rights reserved. Thank you for the review. this one sounds like one I would like to sniff. I think my favorite PPC is Samarinda, though I haven’t tried them all. When lived in Indiana, I grew Nigella for its lovely flowers (that really last in arrangements), cool seedpods, and the seeds. The seeds are used in various cuisines including Indian. They are sometimes called black cumin and have an onion-y taste. They are really good on top of rolls and crackers. Oh wait…that seed/spice sounds familiar…! Thanks for connecting those “nigella” dots for me! Sounds worth a try. I’m in suburban Chicago, and have noticed the weirdest thing I’ve ever seen in November: a house on my afternoon walk has blooming Morning Glories, and they’re the exact color as those Love-in-a-Mists. House is less than a block from Lake Michigan, where in summer, it’s typically substantially cooler than even slightly inland locations. Nov 3, and no frost yet. Hope there’s not hell to pay in store! I just noticed a fresh morning glory bloom on my own vine, too — at this late date!! So strange…! Love-in-a-mist is a lovely flower, but after sprinkling one packet of seeds around my garden two years ago, we now have to weed it out like crazy to keep it from out-competing everything else! The flowers on our plants have no smell, but maybe there’s a fragrant cultivar? At any rate, as a fan of Honey Blossom and lilac, mimosa, and clover notes in general, this sounds worth sniffing out! I’ve grown this pretty little flower. Ours has no smell either. I think the perfumers just imagined a fragrance. I’m going to try to find some seeds for next spring! If the perfumer did dream up this scent, she certainly did a good job — it smells just as it “should.” The website description says that she used a “rare distillation of nigella damascene,” and now I’ll have to track some down just so I can smell that, too. How dominant is the pink peppercorn note? Well, fortunately (in these days, when pink peppercorn is overused!) it’s very light. 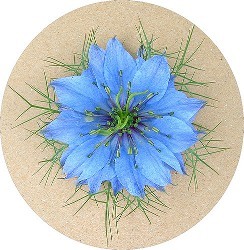 I didn’t know that love in a mist was the name for Nigella Damascena. This flower in particular has been one of my obsessions recently, due its exotic and beautiful flowers. I recently received 5ml of its absolute and in pure form it smells like honey and flowers saturated in honey. It’s very intense and sweet and i’m still thinking of how i’ll compose with it. Isn’t it the perfect name for that flower? I love learning about the names and symbolism of flowers. It’s the neo-Victorian in me. I love the symbolism of flowers Jessica, it’s so rich! Basically the honeyed accord that you smell here Jessia is the Nigella by itself. Well, i purchased mine on Hermitage Oils. Lovely review for what sounds like a lovely fragrance. I say it seriously but it’s now almost a joke since I haven’t bought samples in forever – but it *will* go on my “to sample” list.